Hello, John. And welcome to the Poetry Zone. First question. Why do you write poetry? For me, writing poetry is a joy. It’s very rewarding and satisfying to have written something that might make other people laugh, or cry. I like it best when they laugh but if they cry it means that recognise something sad that we can both share. Do you write anything else? As well as poems, I write or make up stories but they’re not ‘book stories’ they’re stories for performance as I’m a storyteller who uses drama and comedy in my performances. Do you write for adults? Yes, I do write poetry for adults and over many years I have published six collections of poetry for adults. My most recent was a book of poems (along with my own photographs) of the Scottish Islands. Many years ago I wrote ‘Zoomballoomballistic’ and then ‘Rockets & Quasars’ for children. Then I did two books with that wonderful artist Charles Fuge – these were ‘Bears Don’t Like Bananas’ and ‘Dreaming of Dinosaurs’. 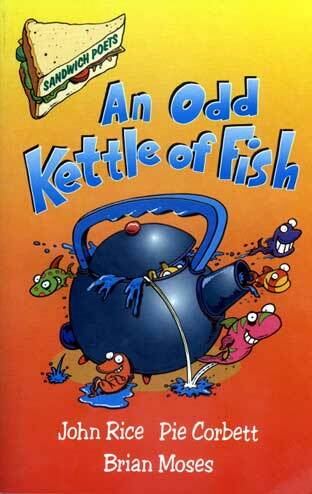 I’ve also written ‘Down at the Dinosaur Fair’ for infants and I was one of three poets who are featured in the book ‘An Odd Kettle of Fish’. How long does it take you to write a poem? A cup of coffee. That’s how long it takes for me to write a poem – well at least write the bare bones of a poem. What takes longest is getting it right because you have to spend ages improving it. Charles Fuge and I spent a full year writing 50 poems and doing illustrations for ‘Dreaming of Dinosaurs’! By the time we were finished we were sick of dinosaurs! for his name is UNPRONOUNCEABLE! When they were young my daughter and my two sons inspired many, many poems that I wrote. Nowadays my daughter especially (Stevie is now 28) figures in many of my poems. She is what this poet calls ‘his muse’ – it’s an old word and perhaps an old idea, but it is certainly true for me. How do you write poems? I used to write in a notebook then type up my poems but nowadays I use a computer at home and a laptop when I go away to write (especially when I go to the peaceful Scottish islands). Do you have a special time to write? At the moment I am gathering together some of my most popular and enduring poems in the hope that I can publish ‘my greatest hits’ and I’m also writing some poems which are about Kent, where I live. They have been commissioned by Kent County Council for a book with photographs of the county. there’s a bookshop dark and dull. because he comes from Hull. the book spooks all go BOO! they’d like a word with YOU! there’s a stack of scary stories! he’s a very odd book cellar! there’s a bookshop dull and dark. so it gets a low book mark! 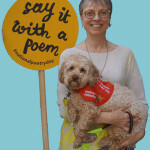 Yes, I visit schools, colleges, community centres, churches, sports centres, playgroups, museums, old folks homes, kennels, scout huts, barbers shops, garden sheds – anywhere there might be an audience for poetry! 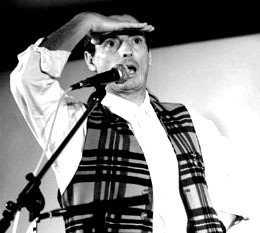 In fact I have visited over 1500 schools in the 20 years I’ve been a poet and storyteller. Do you travel around much? Occasionally I visit schools in Scotland. If I am invited to a book festival or big event like that, I will travel as far as it takes, but normally I stick to the South of England. Which is the most unusual school you’ve visited? Castlebay School on the Island of Barra where the children had translated some of my poems and songs into Gaelic and learned them off by heart! It was strange hearing my songs sung in another language. 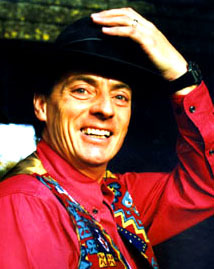 My most memorable day was on the 12th March 1987 (my birthday) at Istead Rise School in Kent where the children, teachers and the librarians wheeled in a huge wheel of a birthday cake with blazing candles for me during my performance! Amazing. How about your worst moment? I was in the middle of a performance in a school when I slipped and spilled Lucozade on a boy who was sitting in the front row. The Head Teacher came into the hall when he heard all the children laughing and thought the boy had wet himself with laughter! Have you been on TV or radio? I’m often on radio and a few times I’ve been on TV. I was featured on a 20-minute programme called Seeing and Doing and it has been seen all round the English speaking world – America, Canada, New Zealand, and Australia. Of all the wonderful poets I read my favourite is still Robert Burns. He is the Scottish poet whose poems I learned as child and when I hear them sung or read today they still make the hair on the back of my neck rise. 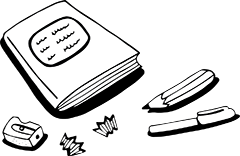 I don’t recall writing poems at school but I do remember writing essays and stories – I always loved writing and when I started I found I couldn’t stop! I guess I started writing poems after I left school. When I was at school the subject I liked most was languages. I took French and Spanish – let me count to four in Spanish for you: Uno, Dos, Suzi, Quatro. is me, the baby seagull. is me, the BBC gull. I support the Scottish team Celtic and, of course, LIVERPOOL! Me too! Liverpooool, Liverpooool, Liverpooolllllllllll!!!!! Every morning I go running (I’ve been a marathon and long distance runner for many years) and since they built a sports centre and pool in our town I can now go running and swimming every day. Every night I fall asleep watching telly – well I’ve been running and working all day and I’ve got to get up at 6 am to do it all again!!! My eldest son lives in the USA now and he’s getting married in Boston. This will be my first trip to America. I’d like to go Thailand as I need a new tie. I’d also like to go to Iceland as we’re running out of frozen sausages. 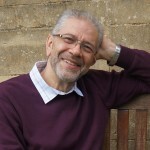 In the past 20 years schools have helped create a marvellously productive climate for poetry and poetry writing – I think they deserve loud and long applause. I hope schools continue to see poetry as an important, relevant, living art form that can appeal not just to children (who obviously love reading poetry and having it read to them) but parents as well. I find schools are beginning to invite me to do more family workshops and performances than ever before. This is great progress. with a big estate car. where a cat lies curled. where the young aliens play. who feel very much alone. who’s a duplicate of me. Finally, what advice would you give to young poets? My advice to all young poets is this, always wash your legs before you sit down to dinner – you never know who might be under the table! Oh, and by the way, if you want to be a good poet, then practise. Thank you. And now here are some questions for your visitors. 1) Who invented the pillowcase? 2) Would you like a stick? 3) What is your favourite ocean? Please send your answers to The Poetry Zone because I don’t care! All poems on this page copyright John Rice.